Audi e-tron GT concept breaks cover! Following in the footsteps of Audi e-Tron SUV and the Audi e-Tron Sport back slated for 2019, Audi has just debuted their third vehicle in the e-Tron lineup. 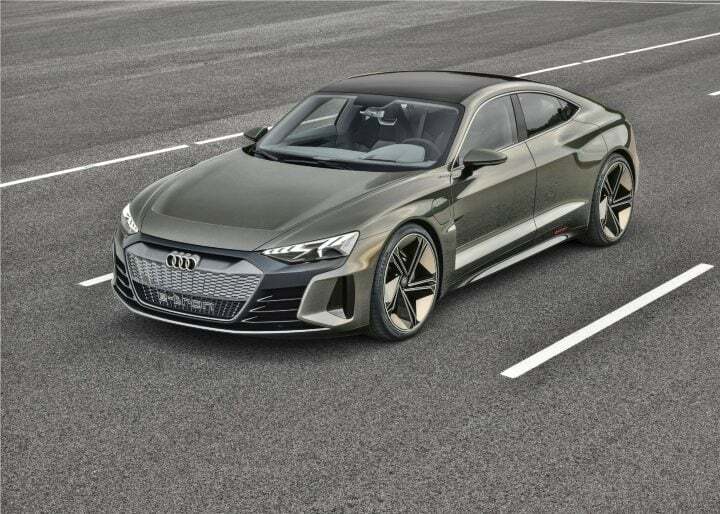 Known as the Audi e-Tron GT Concept, it is a four-door coupé which is a head turner and will probably steal all the limelight at LA Auto Show this year. Audi e-Tron GT Concept has a flat-floor architecture that provides for exciting proportions and a low centre of gravity. It reflects proportions of a classic Gran Turismo with 4960 mm in length, 1960 mm in width and 1380 mm in height. The body of Audi e-Tron GT concept is constructed from a combination of various materials. Carbon, high strength steel and numerous aluminium components are used to construct this electric beast from Audi. The arrow-shaped front section also emphasizes the matrix LED headlights with laser high beam, underscoring the dynamic presence of Audi e-Tron. A light strip runs across the entire width of the rear. The strip dissipates at the outer edge, in the actual lighting units, into individual wedge-shaped LED segments. The architecture is similar to that of its SUV sibling, the e-Tron SUV which will make both the cars instantly recognizable even in dark. The new exterior color kinetic dust looks more practical rather than being ‘technoid’. The interior of the Audi e-Tron GT concept provides a dose of everyday usability, coupled with superb quality interiors that feels good. The functional center of the car is located at the front left, a little tilted towards the driver. The center console, the large touch-screen in the top section and the line from door rail and cockpit frame the driver’s workplace and perfectly incorporate the driver ergonomically with the controls and infotainment system of the car. The car incorporates Sports seats, inspired by motor racing in both rows of seats which provide an optimum lateral support at high speeds and at turns. The designers of the car have gone with the use of sustainable materials, which is a contemporary automotive design. Sophisticated synthetic leather interior is used for the seats and other surfaces. Fabrics made out of recycled fibers is used on the seat cushions, armrest and on the center console. Audi e-Tron offers two luggage compartments with a rear boot offering up to 450 liters and an extra 100 liters is offered under the hood. Audi e-Tron comes with 2 discreet electric motors on both the front and rear axles. The two motors are permanently excited synchronous motors, always ready for action. With 434 kilowatts or 590 hp, Audi e-Tron puts an impressive figure on the table for other electric cars. In future, the vehicle should be able to accelerate from 0 to 100 in around 3.5 seconds. The top speed is regulated at 240km/hr to deliver the range. The range of the car would be 400 kilometers, determined according to new WLTP standard. The essential drive energy of the car comes from a lithium-ion battery with an energy content of more than 90kwH. The battery takes the entire underfloor area between the front and rear axle of the car. Audi is being really offensive when it comes to electric cars. It promises to offer 12 automobiles with all-electric drive by the year 2025. 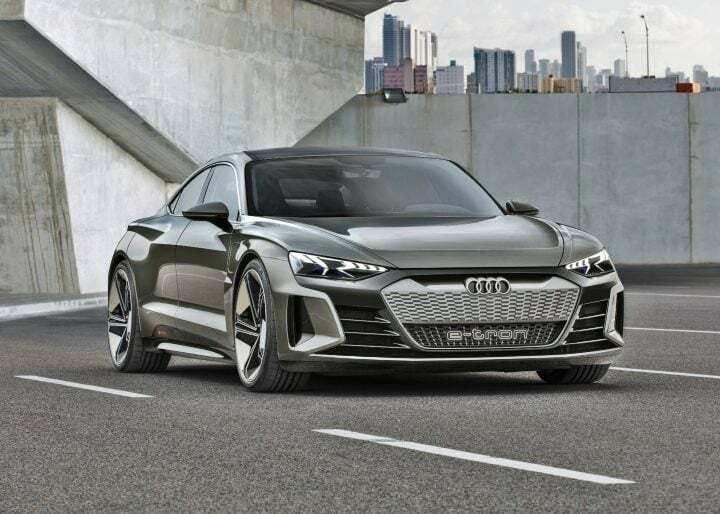 Audi e-Tron GT concept’s siblings the Audi e-Tron SUV and Audi e-Tron Sportback are due to make a debut in 2019. Audi e-Tron GT concept will hit the roads in late 2020 and will be available for delivery in early 2021. Audi’s plans look promising and we hope they manage to deliver to their promises in time.